What is Transmission in a Car? In this post I am going to tell you what is transmission in a car. We have many time heard the word “transmission”. But few of us know the real meaning of it. Today I am going to answer this question and after reading this article you will know, why we use transmission in a car. Before starting this article I have some question in my mind. I think, you should ask these question yourself and try to get the answers. 1. Why we shift lower gear when driving on the hill? 2. Why we shift higher gear when driving on straight highway? 3. If there is no transmission box in the car does it run efficiently? 4. What does transmission mean? We should know the answers of these question, so we can take the right decision when driving a car. I think, there are many other questions arise in your mind after reading these question. So today I am going to tell you, what is transmission in a car which will clear all the doubt arises in your mind. A transmission is a device which is used in a car for obtain different speed and torque ratio, which is known as driving ratio. A car is driven by the engine power. When the fuel burn, it generate the engine power which rotate the flywheel. We know that power is function of product of torque and speed. It means for constant power, if the torque increase, it decrease the speed or vice versa. The torque is the driving force which run the vehicle. When we climb a hill we need more force to drive the car and when we drive on straight road we need more speed to drive. But the engine generate a constant torque and speed combination. So we need a device which can obtain different torque and speed ratio, so we can drive smoothly in any driving condition. This device is known as transmission. In the simple words, transmission is a device which can obtain the correct driving ratio according to the driving condition. It is the combination of the gears which are arranged in a manner, so it can change the gear ratio according to driving condition. This arrangement of gear is known as transmission. The transmission box is placed between clutch and the propeller shaft. The transmission box receive power from engine and transfer this power into appropriate driving ratio, to the wheels through the propeller shaft. This is the basic fundamental of transmission in a car. Also Read : What is CVT Transmission? 1. Obtain the correct driving ratio according to driving condition. 2. Transfer the power from engine to wheels of car. 3. Obtain required torque (force) according to load condition. 4. Provide a smooth driving experience. 5. provide the facility to take reverse the vehicle. 6. Provide the neutral gear condition. 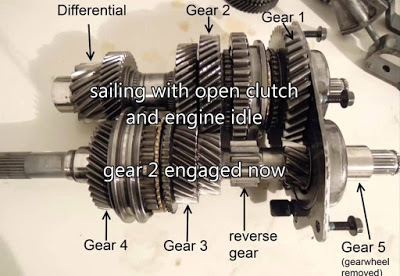 The transmission work on the basic principle of gear. We know that when a small gear drives a bigger one, we obtain more torque compare to driving gear and vice versa. So a transmission box is simply an arrangement of gear in which many small and big gear are situated on both driving and driven shaft. The driving shaft it connected to the engine shaft through clutch. The driven shaft is further connected to the propeller shaft which connected to the wheels. When we start the engine, it drives the driving shaft of transmission. 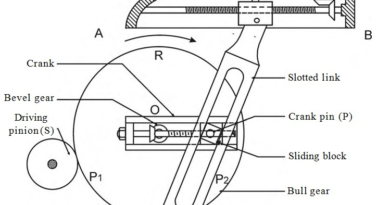 Initially in natural condition the driving shaft is free to rotate and does not connected to the driven shaft. When we shift the gear one of the driving gear make pair with the driven gear, which drives the driven shaft hence wheels. The size of the driving and driven gear is depend on the torque need to move the car. When the driving condition change, we change the gear to obtain appropriate torque and speed. You can also check the video which can more helpful to understand the working of transmission. Today we have learn about What is Transmission in a Car. If you have any query regarding this article, ask by commenting below. If you like this article, don’t forget to share it on social networks. Subscribe our website for more informative articles. Thanks for reading it. ← What is rivet? What are main types of rivets?